You love fishing so much that you took your precious time to purchase the best spinning reel you could get for your fishing rod. After investing in this and using it for some time, you will start to realize that your spool is becoming harder to spin or it binds after getting wet. Well, as an angler, you need to work with a good fishing rod for maximum yield so you may consider spending another fortune replacing the faulty one. Wasteful, right? The other option you have, which is the best option, is to know how to maintain your spinning reel and do it for yourself. I agree though that the construction of these reels is quite complex. You might think you are dealing with a dismantled old-fashioned watch. It is for this reason that the whole maintenance process requires you to involve your mind and memory. It also demands patience and some element of being thorough. If you need to get into fine details on how to do it, make sure to catch a tutorial on YouTube. It is only when you like that gear you own that you shall conserve it as supposed. As a maintenance measure, you need to clean your fishing equipment appropriately. Everybody knows how to clean at least one thing: could be your teacup, teeth or car. You must agree that there are strategies and equipment used for each cleaning practice. These reels are no exception as their material and make are specific to how you are to clean them. You will not, for instance, use freshwater to scrub the outside of the reel because it will wash away all the valuable grease and replace it with crud. Below is a list of items you require for the entire cleaning process. You will use the cleaning apparatus at hand in a given order to yield ideal results. 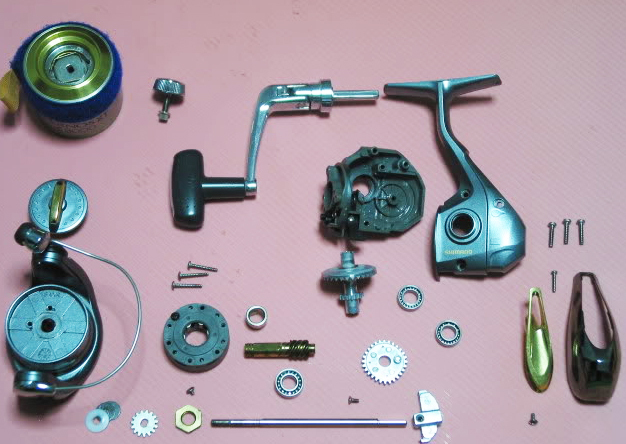 Types of spinning reels vary and so do their components. Below, however, are general steps undertaken to clean any of them, in that order. As energetic and psyched up as you may be, you do not want to keep moving up and down looking for an item you need in your cleaning process while already cleaning. Buy the required lubricants and tweezers before the start of this activity. It shall save you a lot of time and energy. This shall also help in avoiding the loss of any part of the bobbins. You will feel wasted and overworked when you stand to go looking for an old toothbrush then come back to your practice, only to realize you do not remember what you had already done. You will have to restart or skip some steps unknowingly. Gather your items in advance to avoid such. You should clean the reel on both the outside and the inside. If there is a step you should give your all, it is the disassembling step. If one thing goes wrong here, so much that follows goes wrong. That is why if you are a novice, consider reading your product manual or watch a guide video on YouTube. Disassemble procedurally and label each component you remove in that order. You have to be patient. This way, you are less likely to lose anything. Your reassembling process becomes simpler, especially if you remember what part belongs where. You can also put the tiny screws in a suitable surface, like a used egg carton. Having to purchase one tiny screw or searching for it in the thick grass is very frustrating. You may think that you are maintaining your spinning reel when you are actually destroying it instead. Using abrasive and harsh cleaners could damage sensitive metal parts inside. This is why it is important that when preparing for maintenance, you purchase the specific components required. Biodegradable solutions and that old toothbrush can do this work perfectly well. Using gasoline-based products is an uncouth move. It is wise to use the reel specific lubricants and greases, as they go a long way in improving performance. These oils do not solidify in the reel as they form molecular bonds with the metal. They cost a little more, but worth the take as they work a little more too. When cleaning metals, avoid getting them into contact with each other; metals should be in direct contact with the fiber. Remember to use tweezers in handling minute wires and metal clips to avoid their loss. Cleaning is such an enjoyable thing when you make it that way. After your reel is sparkling clean and assumedly as perfect as it was when new, you have to rebuild it for use. If you do it wrong, it may malfunction or never work again. t is particularly easy doing this when your parts have labels. You will just have to follow the order in labels and some memory to put it back. In case you get lost, refer to the manual from your manufacturer. When done putting the parts back together, clean the outside. Oil the handle knob and the inner shafts. Use appropriate oil to avoid destroying your cherished equipment. Using enough oil minimizes chances of corrosion by water, particularly salt water. Ensure that you test the reel when you are done. If it works perfectly, store it well. Avoid dusty environments. Here is a video tutorial for better understanding. It is clear that the cost of maintenance here is much less than the cost of purchasing new equipment. It is also easy; you just need to portray order, clean appropriately and grease gears and bearings. 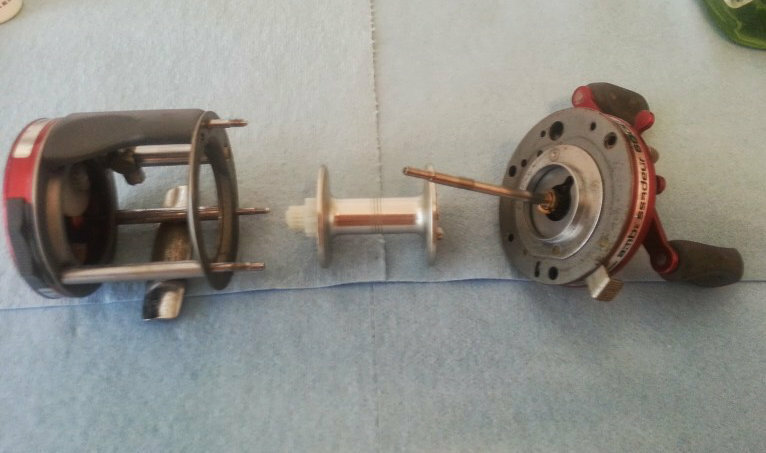 The spinning reel becomes as good as new after the whole procedure and takes a while before you maintain it again. For confirmation, test how efficiently it works after maintaining it. This way, you save yourself the trouble of cutting short a planned fishing expedition due to a faulty item.